Since I have already explained about the handy lentil powder in this post , I will not go into that again. Suffice to say that I always keep this powder in stock in either of its versions since I like the thought of having some back up plan in case I am unable to get anything ready for dinner.Although I always manage to get something ready for dinner, the very thought of having some kind of fall back plan gives me satisfaction especially on those days when I get late in getting dinner started. This version of the lentil powder is different from the earlier version of the powder I posted on this site and differs subtly in taste since it has more ingredients and the curry leaves in this powder imparts a wonderful aroma to this powder and enhances the taste and flavor of this powder. This one is another one of my mother in laws recipes that she gave me and has become a regular in my kitchen since. Dry roast each of the above ingredients separately except the salt. The lentils need to be roasted until they turn reddish and are exuding an aroma. The curry leaves need to be roasted for a few seconds until it turns dry.The black pepper and red chillies until it changes color. Cool all of these ingredients and powder in a blender/ spice grinder until fine. Keep stored in an airtight container for months and use as required. When serving the powder needs to be mixed with hot rice and served with a few drops of ghee (clarified butter) or sesame oil on top. About one teaspoon of this lentil powder will be required for about 3/4 cup of cooked rice or more or less depending on your taste and how much heat you would want.. Serve with any curry and appalams/ pappadums on side to make a complete meal. Looks good Usha..As Asha said it must be good with yogurt rice :)....good one. I will try to make it. Great with rice & ghee... 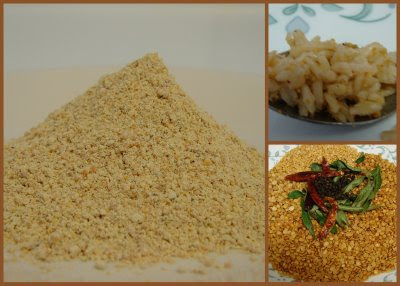 I make paruppu podi differently using dalia. Must try your version sometime. Podi looks lovely Usha...i end up eating more idlis/dosas...i just love them. I've never used lentil powder before. It sounds great. Hot rice and dollop of ghee, We are set for dinner or lunch! Tasty one! powder looks yumm..I love these kind of podis! !thanks for the recipe..wil give a try sometime!! I make a similar version of podi. Can't imagine cooking without them. Powder looks yummy.. looks delicious..
You said it Usha, I feel I have a handicap if I don't have a stash of podi. It is a great side for pretty much anything. My fav podi..love to have with hot steaming rice with ghee, heaven na!!! Podi is what we eat atleast thrice a week with rice.. I never tried making them at home. I get the podi varieties from india or buy them from the local stores.... Now seeing your podi, it tempts me so much that i'm going to make it soon! simple and yet so comforting with a bowl of rice and ghee... nice pic. Something new for me. Thanks for sharing Usha. Very authentic and nice back up..Perfect with hot rice and ghee.. I like to keep Paruppu podi handy also, if Iam lazy to cook, I have paruppu podi and gingelly oil mixed with rice.Yum!!! Yum!!!!. I make Molagapodi just like you and its a hit with all my friends here in Singapore. some of my friends used to bring it in the hostel reviving old memories, yummy podi! Sounds like a perfect solution for a quick and healthy meal. I love paruppu podi with hot rice and ghee! Picture reminds me of my mom's!! Great one Usha! my kids Love Podi. Thaks for sharing. Something new for me. Thanks for sharing.